This is me, two years ago today on Monday 11 August 2014 having just gone through the largest of the 11 cleft related surgeries I have had to date. 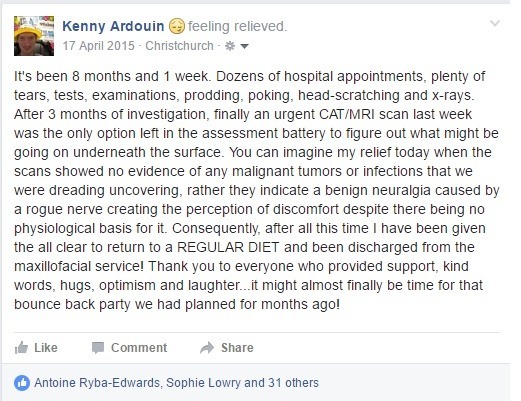 On this night two years ago, I was lying in a hospital bed in Ward 11 of Christchurch Hospital while some very skilled people and machines ensured that I would see the morning. This day, 11 August 2014, has undoubtedly become a defining moment in my life with many events of my life being referenced as either before or after this date. 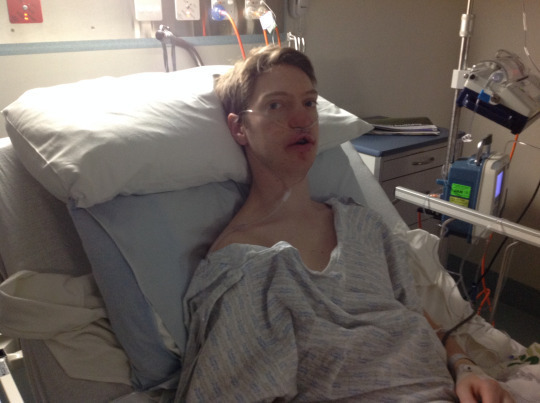 This surgery continues to affect many aspects of my daily life two years on, that I don’t generally discuss, as it can be so incredibly difficult to articulate and put into words, but I am going to attempt to explain what the last two years have been like here. The side effects of this surgery were set into motion years before the actual event. It was to be a big procedure that required a significant commitment from me, and it was a one way procedure, no going back. I denied the opportunity when I was nearing the end of high school, but once I left high school, I became more self-conscious and realised that this surgery had the potential to change my whole thinking about my own appearance. It’s interesting how we all like to emphasise that appearance is not important, but we all know deep down that society cannot easily look beyond it, until someone really gets to know you, and even then, it continues to be of some importance to some extent. I also realise that my decision not to have surgery had upset my dad who was becoming less tolerant of my decision and would derail nearly every conversation to put pressure on me to go through with it. In hindsight, I suppose that this was coming from a place of frustration, having always wanted the best outcome for me, then being upset when I began dragging my heels. But, it had to be my decision, and eventually in 2012, it became my decision to go ahead, with the surgery finally happening on August 11 2014 following two years of preparatory orthodontics. Over the last two years, the recovery has been anything but straightforward, and has been ongoing. Psychologically, the two year mark is incredibly significant, as it marks a transition from a “recovery” mentality, and into an “acceptance” mindset, as two years was the maximum time frame in which recovery occurs. In the days and weeks that immediately followed August 11th 2014, I was pleased with my progress – firstly, I was relieved that this big weight of this surgery that had hung over my shoulders for years, had been lifted. It was liberating. Secondly, I was at the worst that I would be – from that point, the only way was up, and things could only improve and get better. Thirdly, the prognosis was good – it was still early days, and it takes time to recover from such a large procedure and for everything to settle down; I had no reason to doubt that I would make anything other than a full and complete recovery, and be a better looking, better speaking, better eating person. Those were the three main objectives of that surgery, and the only one that I believe has been a true success is the first, which is great as I feel more confident than I did this time two years ago, and generally receive a more favourable first impression than I had previously. However, after a while, recovery begins to plateau and it becomes harder to tangibly see recovery progress. I would say that the other two objectives have most likely become worse following the surgery, and I have experienced more scares and long-term side effects than I had anticipated, and I am telling you about these today, as I think that they are here to stay with me, and so are a part of me that I am coming to accept. My speech, I feel, is worse than it was two years ago, which has been a heavy blow given that my chosen vocations rely on speech. You may not necessarily agree, as I put a lot of effort into talking as clearly as I can for you, but I have noticed it takes me far more effort to speak than it has in the past, and I have also noticed that I have been asked to repeat myself more often than I did in the past. I feel as a Speech Therapist, that my own speech can be a real elephant in the room sometimes, make no mistake, I am not being lazy, I am doing the best that I can. As for eating, my options are more limited than they had been prior to surgery. After 8 weeks on a puree diet, then a further 6 months on a soft diet, I am technically able to eat a normal diet, but many foods such as apples, anything that requires serious chewing and anything that is particularly hard are off limits. I only have use of the left side of my mouth for biting and chewing, the right side literally can’t pull its weight. 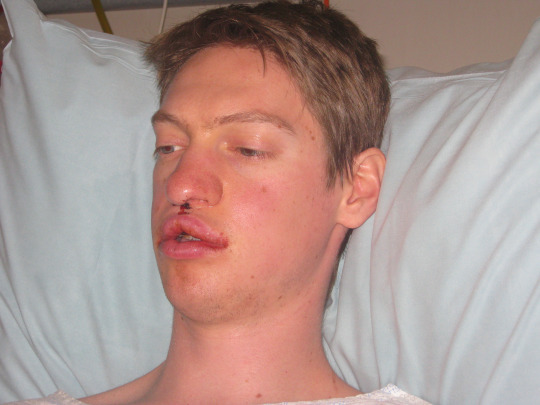 In fact, if the right side of my mouth and jaw had behaved like the left hand side, I would be quite content. 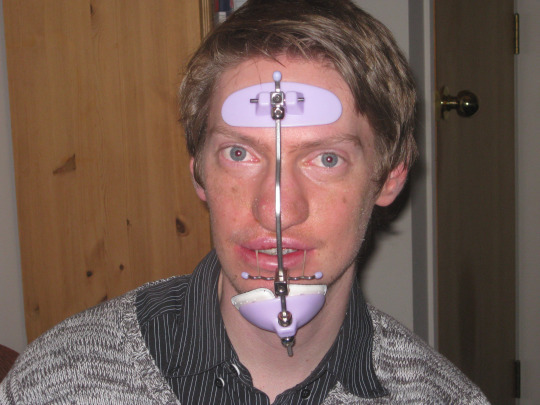 This is not surprising though given the surgery was a lot tougher on the right side of my jaw and face – it physically had to move further – 9mm forward versus 5mm on the left. That may not sound like much, but jaws are not supposed to move and it means that it created a 9mm gap behind my jaw (where you would have bone). But it wasn’t just the jaw that moved – all of the connective tissue, teeth, muscles and nerves had to move with it. Something didn’t quite go as I’d have hoped in that process, and the hardest thing, is that I don’t know what isn’t right, but it manages to cause me worry at least once every single day! I have visited hospital many, many times over the last two years to try and get to the bottom of what is going on. Every time, they would ask me what the problem was, and every time, they would look and find nothing. The only way that I know how to describe it, is imagine that every time you bite down, your entire jaw feels loose and like it is going to fall out. When you touch the side of your own face, the feeling in your hand is as if you are touching somebody else’s face and not your own as the only place you feel it is your hand – not on your face, even though you can see in the mirror you are touching your face. Imagine, intense pain every time that you clean your teeth on one side of your mouth. When you talk, laugh, smile, you get an unnerving tingling that feels like everything is about to give way and your jaw is going to fall out of your head. Imagine that if you don’t move your jaw regularly, it stiffens up and begins to ache until you massage it. You forget to wear your retainer one night, and you wake up feeling as if someone has punched you in the mouth. You try to build up pressure in your cheeks and not only is it impossible but all your teeth feel like they’re going to pop out. It affects the most intimate moments; for example during kissing, instead of relaxing and enjoying the moment, you’re concentrating on how not to injure yourself in the process. You shave above your upper lip and reach the right side, and experience a mixture of not being able to feel anything, and areas that are hypersensitive. These are all moments and sensations that provoke a lot of anxiety for me. 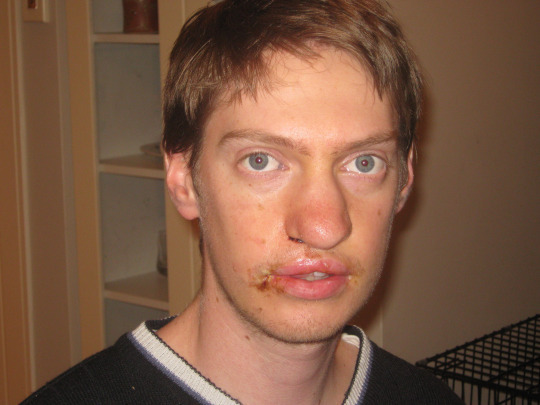 The swelling on the right side of my face never did fully go down – there is a definitive “bump” that I can see looking in the mirror or feel with my finger. In early 2015, this bump was the cause of a cancer scare which was later found to be benign – a finding that gave me one of the biggest feelings of relief and gratefulness I’ve experienced. My medical team have run dozens of tests, X-rays, 3D scans etc., even sending me for a scan at another hospital at one point to see if anyone else could see something they were missing, but every test, xray and scan showed up completely normal. I felt that when I kept coming back, that my team were beginning to think that I was malingering, but I knew something is not right, but like them, I can’t put my finger on what it is. There are only so many times that you can return to your car feeling reassured every time a test finds nothing and you are told you have nothing to worry about, before you begin returning to your car in despair and crying on the way home that no-one knows what is going on, and they’re taking you less and less seriously each time. The closest we have managed to get to a diagnosis is that there is likely a trigeminal neuralgia – sudden, intense moments of nerve pain and discomfort with no physiological cause. If I’m ever talking to you and suddenly stop and appear to wince, or excuse myself for a moment, it is likely an episode of this is happening. 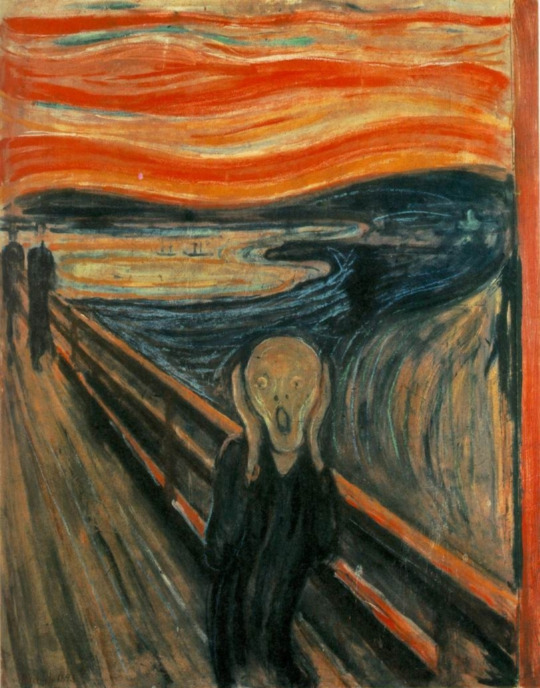 I do my best to carry on as much as I can as I do my best to reassure myself that it’s pain with no cause, so theoretically, no need to worry, but this picture “The Scream” is a good illustration of how it can feel. This is something that I am learning to live with. Tinnitus is another. Tinnitus is a deafening ringing in your ears, which can be associated with jaw injury, or anaesthetic (among other things). This is something that cannot be treated, but I manage it by avoiding situations that are truly silent. It’s easy enough to drown out by having white noise – such as by having the car heater on in the car, listening to birds in nature, going to sleep playing rain sounds, and playing music, but every now and then, it makes me very frustrated and upset after having previously enjoyed 23 years of my life without experiencing this phenomenon. It’s important to acknowledge that I have no blame or animosity towards my medical team with regard to these side effects, they have not occurred through any negligence on their part, they are just unfortunate things that can happen. I do however, feel that lessons can be learned from how this was handled, so that the next person doesn’t have to push nearly so hard to be heard. I am grateful for what the team has been able to achieve for me, and despite the setbacks, would still have done it if I knew then what I know now. Looking back two years, this has been something that has definitely has affected my psyche in different ways, at different times. There are only so many setbacks you can bounce back from, before you begin to lose some of your resilience. In mid-2014, I did not let on much, but I was scared. I had a few health scares in the lead up to the surgery, question marks around the strength of my heart becoming a self-fulfilling prophecy as your heart has to work a lot harder when you are nervous and stressed. There were a number of false starts where the hospital gave me a surgery date only to cancel it, and due to unforeseeable circumstances, change the surgeon mere days before the operation after having had years of build up under somebody else. I have done a lot of learning in the past 2 years. I feel that I have aged at least 5 years in that time, and learned a lot about myself and life while on the journey. 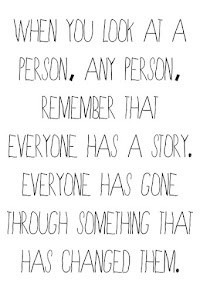 I have had my best days and my hardest days of life so far within the last two years. 11 August 2014 will always be a part of me, a defining moment in my personal history, and one that despite the pain and discomfort that it has caused, and will continue to cause, has also improved how I look and feel about myself, and played its part into shaping me into the person I am today. Thank you to all the people who demonstrated love, kindness, support and understanding over the past 2 years – keep doing what you’re doing, the smallest acts of compassion at the right time can make a world of difference.